Save on Come From Away on Broadway tickets by purchasing them before you travel to New York. Buying theatre tickets online is safe, easy and saves time and money! See this show in the Gerald Schoenfeld Theater. 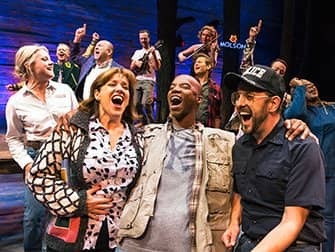 Come From Away tells the true story of a Canadian town. On September 11th 2001, 38 passenger planes were stranded here because they were no longer allowed to enter American airspace after the attacks on the World Trade Center and the Pentagon. The occupants of the otherwise peaceful Gander in Newfoundland welcome the 6,700 unexpected guests with open arms. It actually doubles the population of the town! They make arrangements to keep their large group of international visitors entertained and to make them feel at home. As time progresses, various developments take place within the group of travellers. Couples break up and new romances form. There are also people who discover that they have lost loved ones in the attacks. The special story behind this musical will touch the hearts of everyone in the audience. However, it is also an often funny show about human nature, charity and social relationships. How to buy Come From Away tickets? It is easy to buy tickets for Come From Away with the link below. I recommend buying tickets online before your trip to New York. Why? A lot of shows are very popular and are often sold out. You’ll also save time and money and most importantly you don’t have to stress about finding tickets when you are in New York. 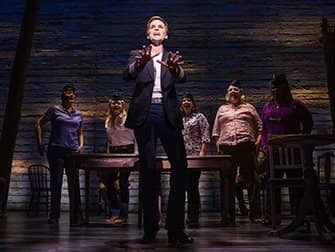 Eric’s Tip: If you want to avoid the more traditional song-and-dance shows, but still want to experience Broadway, then I recommend going to see Come From Away. The price and length of the show are good too. Because there is a small cast and the subject matter is moving, the show has an intimate quality about it. Recommended for ages 10 and up. Children up to 4 years aren’t permitted in the theatre. Don’t want to see Come From Away?